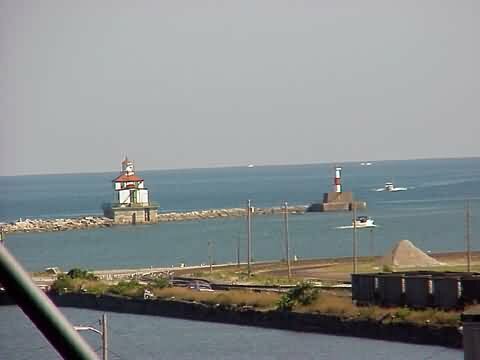 The first Ashtabula lighthouse was constructed in 1836 and was built on a wooden crib approximately 40 feet square with a hexagon shaped tower. A ramp connected the crib to the Ashtabula River's east pier. Captain Bigelow, as the first lighthouse keeper, kept seven lamps burning using sperm whale oil as fuel. In 1876 a new lighthouse was built on the west pier head because of the construction of new dock facilities. A new Fourth Order Fresnel fixed red light lens was installed in 1896 along with a first class siren fog signal. This four-sided building with wooden clapboard siding in a pyramid shape served the harbor until the present lighthouse was built in 1905 when the Ashtabula River was widened and new dock construction was completed. It was built approximately 2,500 feet north of the river entrance and the 1876 lighthouse. Before the completion of the new lighthouse, the river-widening project left the 1876 structure sixty feet out into the river and away from the pier and gave the appearance of a 'floating lighthouse.' Both the old and the new lighthouses could now only be reached by boat. In 1916 the light was moved approximately 1,750 feet NNE of the previous site. The structure was doubled in size and a new 50-foot concrete crib was built to support it. The two-story building was constructed of steel with iron plate. This new lighthouse was now able to house the light keepers. The new light had a height of focal plane of 51 feet. A radio beacon tower was also constructed next to the building. An addition to the 1905 stone breakwall was constructed in 1915 from Walnut Beach. In 1959 the U.S. Coast Guard installed a new Fourth Order Fresnel lens light in the lighthouse. The light rotated and emitted a three second white flash that could be seen as far as 19 miles on a clear night. This light, made in France in 1896, remained in use until 1995 when it was removed and taken by the Coast Guard to be permanently displayed at the Ashtabula Marine Museum. A foghorn was also installed in the lighthouse that blew two blasts every minute. The lighthouse remained manned by the U.S. Coast Guard until 1973 when it was automated. At that time it was the last remaining light to be manned on Lake Erie. If we had realized the view (or lack of view) we would have had of this lighthouse, we wouldn't have bothered tracking it down. I would have to guess we were about a mile from the lighthouse, and that was the best view we could come up with. From I-90 get off on exit 228 and take SR-11 north. Take Hulbert St. to the end and turn right onto Walnut Blvd. Go to the end of Walnut Blvd. There will be a parking lot in front of you and to the left is Great Lakes Marine and USCG Museum. Walk behind the museum and you'll have some real distant views of the lighthouse beyond the iron facility. Directions to alternate vantage point from Gregg Stone at www.SheddingLight.org: I took Walnut Blvd. away from the Marine Museum. At the end of the street, I turned right, down into a public park. Heading straight, I parked at the end of the lane and entered an area marked with "No hunting" signs. I walked parallel to the shoreline and at one point climbed onto the natural breakwater that lay just off shore. 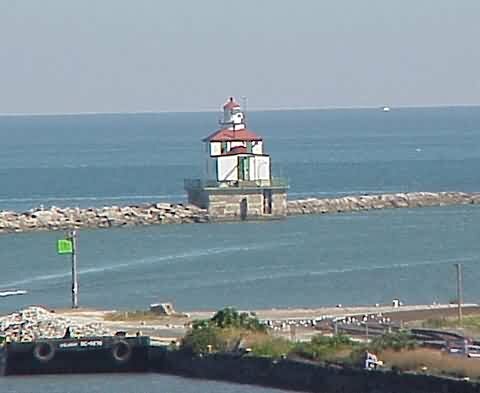 To my delight, the Ashtabula light lay ahead.